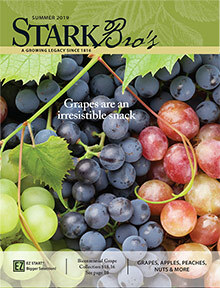 Stark Bro's catalog has been producing the highest-quality fruit and nut trees, berry plants, landscape plants and garden products for more than 200 years. Enter PROMOTION* code - 19SH0001 - at checkout on the Stark Bros website. Fruit and Nut Trees - Grow your own orchard-fresh apples with your first apple tree, or plan an orchard of fruit-producing trees from the bountiful selection in the Stark Bro�s catalog. You will find every kind of fruit tree here, and the expert advice to help you select the varieties that grow best in your region. Be tempted by fruit tree assortments for your kitchen garden, as well as apricot, citrus, pear and peach trees. A nut tree is a beautiful and useful addition to your landscape, whether you choose pecan trees, walnuts, filbert-hazelnut trees or majestic chestnut trees. Berry Plants - Expand your garden repertoire with fruit-producing berry plants. Start with favorites like strawberry and blueberry, and then expand into gooseberries, jostaberries, currants and lingonberry plants. If you love to cook, can or bake, berry plants will soon be your favorite garden additions. For the wine connoisseur, grape vines are an exciting growing experience, with muscadine or wine grapes that produce clusters of fruit, perfect for making your own fruity or spicy wines. Landscape and Garden - Stark Bros catalog is also your best source for landscape trees, with a stunning collection of flowering and shade trees like willows, maples and redbud trees. You will also find a hearty assortment of garden plants. Put your green thumb to the test with horseradish plants, colorful hydrangeas, fragrant lilac bushes and romantic climbing roses. Check out the selection ornamental grasses, vegetable plants, and herbs as well. Tools and Supplies - Everything for both the novice gardener and the expert orchard-grower alike. From books and garden gifts, to natural pest and disease control, this is the online nursery for the best gardening tools and supplies. Find practical products like soil additives, digital soil meters, and garden netting, as well as kitchen and canning supplies. Shop at Stark Bros for all of your nursery purchases, and be confident that the growing resources in their online How To Guides and library of gardening articles will ensure that you have the most success in your backyard garden or orchard.